(CNN) -- For the rocks and other projectiles that protestors are hurling in the streets of Cairo, Egypt's riot police have shields. To combat social media, another important weapon for the demonstrators, outside experts and people living in the country say the government has coordinated a blockage of certain communications websites and unplugged internet access entirely to parts of the country. On Thursday, protesters active on Twitter and Facebook, publicly documenting demonstrations on the streets of Cairo, Alexandria and other cities, went quiet. Around the same time, many websites centralized on servers in Egypt disappeared. On Friday, that Web shutdown seemed to be holding. Reports continued to flood Facebook and Twitter that landline phone service has been shut down in some Egyptian cities, though it's unclear whether that came as a result of a government edict or overloaded networks. Cellular telephone operators were told by authorities to suspend services in parts of Egypt, according to a statement from Vodafone, a global cell carrier that operates there. Lack of cell and landline phone service could prove to be a bigger obstacle to demonstration organizers than the internet disruption. Many of Egypt's impoverished citizens don't rely on the Web in their day-to-day lives anyway, said Parvez Sharma, a documentary filmmaker on Middle Eastern culture. "These people," Sharma said of Egypt's low-income population, "are not Twittering and Facebooking and e-mailing. They've never even heard of the damned internet, most of them." Calling and text messaging is how most Egyptians keep in touch and where most of the organizing has been done on the ground there, said Sharma, who has kept in contact with dozens of friends in Egypt during the protests. But social media sites have been used by key event organizers to reach other visible activists with Web access and to get the word back to other parts of the world. Sharma, an active social media user, is encouraging them to leave notes on his Facebook wall because many friends were scared that posting to their own pages might catch the attention of the government, he said. The Egyptians he kept in touch with through Facebook, Twitter, e-mail and instant messaging went dark on Thursday. A major halt in connectivity apparently came at 5:28 p.m. ET, when servers in Egypt were taken offline, according to a report by internet monitoring organization BGPmon. Six minutes later, the Committee to Protect Journalists, which had been following the situation in Egypt through online sources, reported that 10 of its contacts vanished at the same time from instant-messaging systems. A cybercafe customer in Cairo, Egypt, looks at Facebook on Thursday, before widespread service outages. The phenomenon was also observed by Arbor Networks, which reports that internet traffic to and from Egypt dropped "precipitously" within that hour Thursday. Arbor's security researcher, Craig Labovitz, has been digging through the connection data, and said that the outages were no coincidence. "Egypt has a fairly well-developed communications industry," Labovitz said. "Given the abruptness of the loss of traffic and the diversity of the infrastructure, this does appear to be a coordinated event." Labovitz compared Egypt's internet blackout to that of Iran in the summer of 2009, when the government halted services due to protests. Egypt's Web infrastructure is more sophisticated than Iran's, Labovitz said. Still, Egypt's network only has about 10 companies controlling the key infrastructure that keeps the country connected, making a nationwide government-mandated cutoff feasible, he said. Before Thursday's seemingly more concerted halt of internet services, access to Twitter and Facebook in Egypt was becoming spotty. These services have played major roles in protests in Tunisia and Iran and for dissidents in China. They had begun to explode alongside street protests. "We are aware of reports of disruption to service and have seen a drop in traffic from Egypt this morning," a Facebook spokeswoman said Thursday. Facebook has been referring requests for comment to Herdict.org, a Harvard University project chronicling potential censorship of the Web around the world. The tool reports a major spike in the past few days in Egyptians reporting that both Facebook and Twitter were inaccessible. Herdict reports of any kind in Egypt slowed significantly on Friday, presumably due to residents not being able to access any websites as a result of the shutdown. "Egypt continues to block Twitter and has greatly diminished traffic," said a message Wednesday from global representatives for the microblogging site. The Egyptian government has said publicly that it is not censoring websites. The Egyptian protests are meant to challenge a lack of basic amenities, from affordable food to a decent standard of living. The target is Hosni Mubarak, the nation's 82-year-old leader. 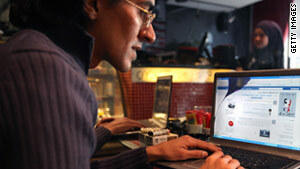 When social media websites were blocked, many in Egypt had found their way around it by using software called proxies. This remains a common practice for people in China looking to skirt the government's "great wall" blocking certain Web services. Proxies can trick internet providers and routing services designed to block certain cities or countries into believing that a person is located elsewhere.